Erik Hanberg's science fiction read may not be a quick read, bit its a highly enjoyable one that kept me up till 3am to finish it. What makes a book that good? Well it starts off very intriguing with a good backstory to finish very climatic, unexpected, and challenging everything you hold to be morally upright. Well I enjoyed the book because of the story telling. It used excellent literary devices and the sensory details were superb. I liked how the author takes character development and warps how you really read books. Parts in the middle could keep you down if your a hack n' slash sort of reader, but they really add to the whole experience. The entire package is clean especially the brilliant cover. 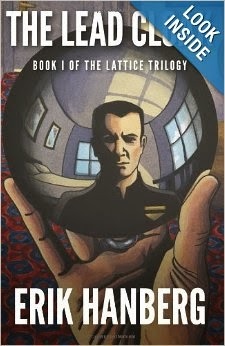 4.8/5 An excellent science fiction novel with a great cover. Took .2 points off because it is long at 422 pages for the paperback but one of the best for the new year!